May 23, 2015 was a beautiful day in Newport Beach, California. 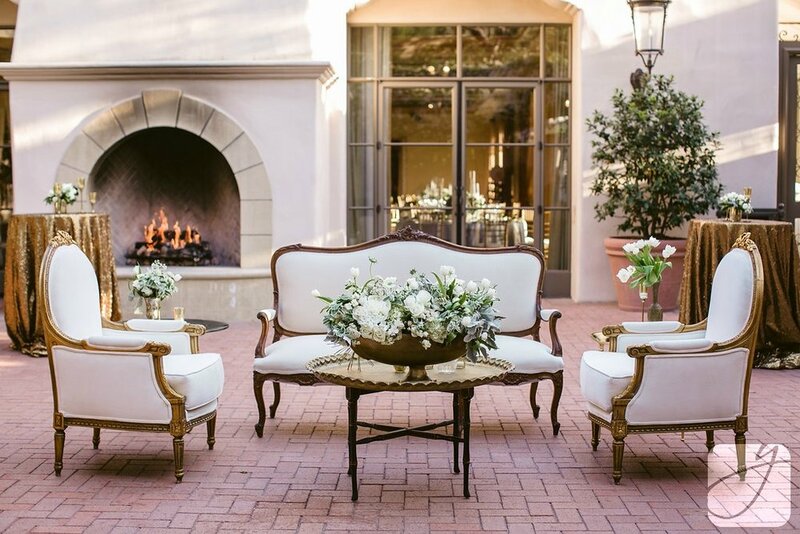 Even more beautiful, however, was Erin and Steve's glimmering wedding at Pelican Hill Resort. We are in love with Jasmine Star's spectacular photography- come take a look at our collaboration with Carrie at Details Details to see more of it! Recently picked up by LoveLuxeLife, we know this one is sure to knock your socks off! First and foremost, Erin and Steve's was as grand and beautiful as it was personal and intimate. Pelican Hill's beautiful Mar Vista ballroom created the perfect glowing environment while stunning ocean views dazzled guests during a romantic cocktail hour. Beautiful black bars were illuminated by crystal chandeliers while mirrored tabletops shimmered from the reflections of taper candles. 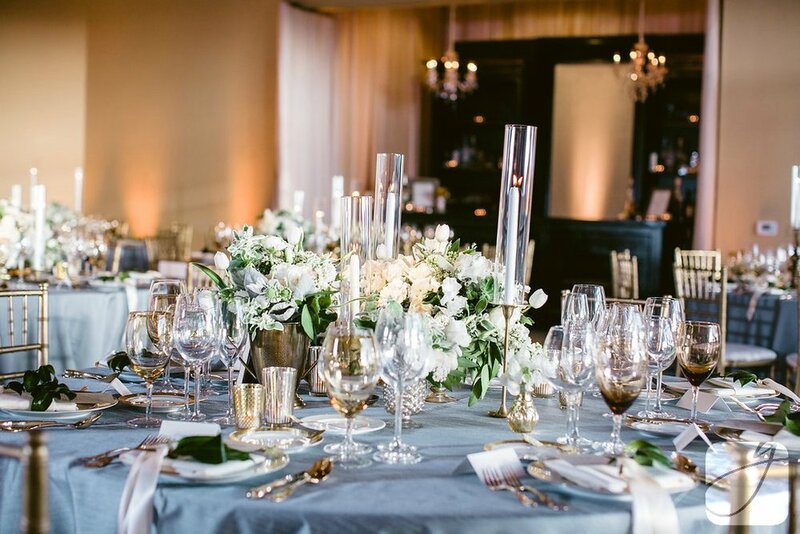 The color palette for this event emphasized light whites and ivories mixed with shimmering and warm golds hues. 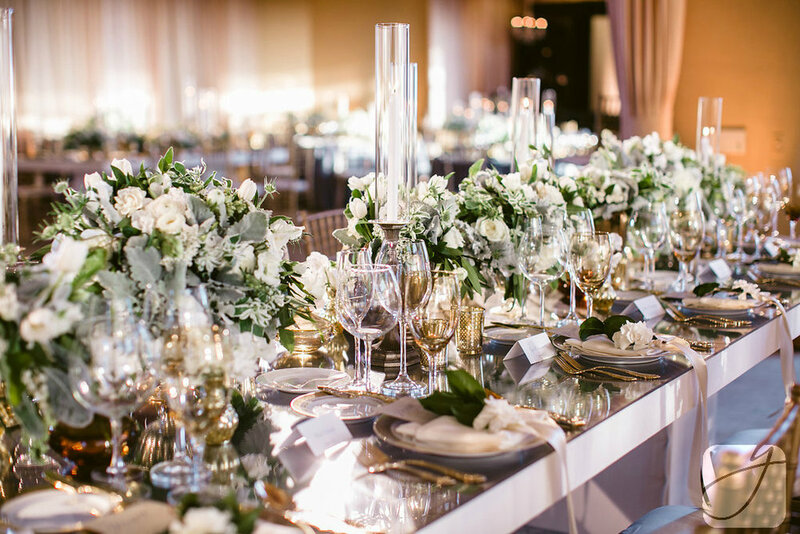 Every component of the table designs- from florals to candles to goblets, votives, and golden chiavari chairs- flowed together! 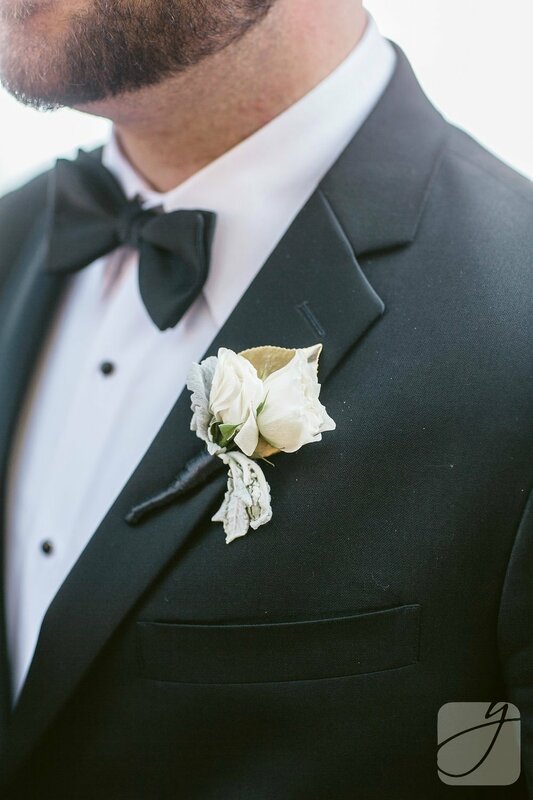 Our florals had a timeless feel to them, incorporating mixed greeneries with various white flowers. Intertwined were dozens of white taper candles with golden votives clustered at the base. Amber goblets and golden utensils with our napkin treatments (consisting on sprigs of greenery with satin ribbons) brought a lot of warmth to the tables. We think the gold edged chargers paired beautifully with this look! 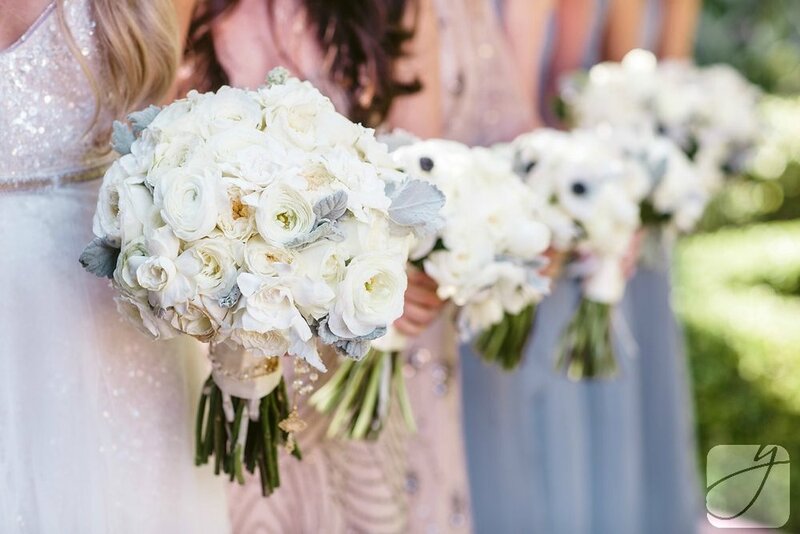 Personal florals had a light color scheme with sprigs of dusty miller greenery spread throughout. Instead of sporting a typical boutonniere, Steve proudly wore his family's crest. We at SYED are all for originality and loved this concept! Chair treatments were created using fragrant bay laurel and gorgeous white anemones with ribbon cascading down. Lounge rentals had an antique and vintage vibe to them that coordinated beautifully with our large golden boat floral piece. While bar and cocktail details were simple, they were classy and beautiful. Using some of our favorite gold lattice votives and taper holders, we created the fun mini golden votives showcased on cocktail tables. Our low golden cylinders reflected the shimmering linens perfectly. Bar pieces intertwined golden props with classically beautiful white tulip florals. Guests found their seats off of one of our favorite pieces of inventory- our oversized frames! Guests were treated to this beauty which was painted a shimmering gold with garland draping off of the sides and tall white ivory pillar candles clustered below. 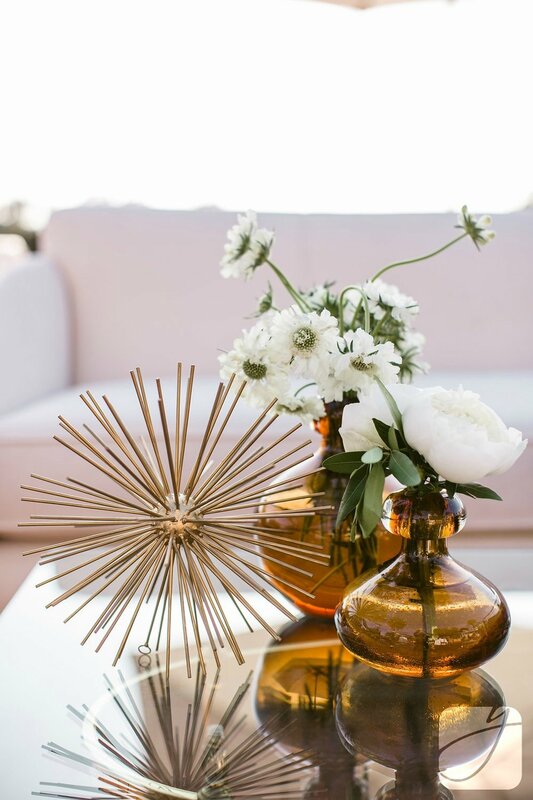 Lounge decor featured various golden props with amber bud vases and white florals. The warmth from these colors created an effortlessly classic and romantic vibe.